Numerology is an ancient science that interprets the weight of numbers, and the impact their weight has on our existence. When a number repeats itself, it delivers an intensified and powerful meaning. The Angel Number 666 holds a significant energy within its vibration, one that may be surprising to most. Angel Number 666 contains different numerical components within its energetic weight, each with their own intrinsic vibration that creates the final frequency Angel Number 666 emits. To fully understand its meaning, we need to analyze the energy of the numerical components within: the Number 6 and the Number 9. One important concept to note is that “666” has been long considered to hold a negative connotation, such as being the “devil’s number.” This could not be further from the truth. It reduces to 9, which is one of the most spiritual numbers in Numerology. And the triple component, Number 6, is the most harmonious of all cardinal numbers. So why does Number 666 have such a powerfully incorrect association? This is something we will discuss in a future article, but for now rest assured that there is absolutely nothing to fear when you see this number. In Numerology, the Number Six reflects “The Nurturer.” The 6 possesses the most harmonious and unconditionally loving energy of all the single-digit numbers. Number 6 emanates energetic vibrations of maternal instinct, sacrifice, domestic life, family, selflessness, protection, and a natural wisdom that is grounded to create tranquility and peace in the physical realm. At its core, the 6 represents love and compassion. The 6 also reflects idealism and analysis. A good way to think of this is to contemplate any maternal figures or energies throughout your life. These influences are able to seemingly solve any problem with logic and inborn wisdom, no matter how difficult or testing the problem is. Patience and determination are demonstrated, not only because it is required, but because possessing these traits comes naturally as an unquestionable obligation. The visual shape of the 6 reflects the energetic weight it contains. In Numerology, any number that has a circular shape emits a feminine love-based vibration. This obviously parallels with the frequency of the nurturing energy of the Number 6; the shape of it symbolizing an entity that is pregnant, or carrying, unconditional love and compassion like the expectant mother. In addition, it is helpful to know that the 6th sign of the zodiac is the mutable Earth sign Virgo, and the 6th card of the Tarot deck is The Lovers card. 6+6+6 = 18 18 reduces to 1+8, which = 9. Of all of the single digit cardinal numbers, the Number Nine holds the most spiritually enlightened frequency, one of extreme humanitarianism. It reflects service to others, life purpose and soul missions and contracts. The 9 is all about spreading love and illumination, making this Earthly existence a better place for everyone. Number 9 also represents spirituality, enlightenment, awakening, the Universal Laws, self-sacrifice, and dharma. The 9 is the last single digit cardinal number, which symbolizes achievement and completion in all forms, but especially spiritual growth. This type of completion reflects foundation-building; seeds of consciousness and wisdom have been planted for growth, within the self and humanity. Number 9 exudes a vibration of Universal and spiritual wisdom attainment, and the path of evolving beyond material needs, desires and possessions. If we all lived a life revolving around unconditional love, there will be an inevitable positive influence, and we must remember that by living by example, this will happen without much conscious effort. The most fascinating concept about the 9 is the mathematical characteristics it possesses. There is no other number with the ability to remain as constant as the 9. For example, if you add any number to a 9, the final number will always reduce back to that first original number. Furthermore, if you multiply any number by 9, it always reduces back to 9 (try it!). The visual shape of 9 is interestingly, the opposite of the Number 6 – it is the Number 6 flipped upside down. As we know, 6 represents maternal, nurturing, compassionate, and unconditional love. The 9 carries a similar feminine-based energy, but adds a vibration that represents love on a much grander scale to humanity. Think of the 9 as reflecting a reservoir of willingly providing service to others, with a spout that faces downward that never empties. Some other aspects related to the Number Nine include the 9th sign of the zodiac, Sagittarius, and the 9th card in the Tarot deck, The Hermit card. Angel Number 666 contains a combined vibrational energy of the Number 6 and the Number 9. But remember, a repeating triple-digit number sequence intensifies the energy of that number; in this case – the Number Six. When Angel Number 666 reveals itself to you, it is relaying a message from your Higher Self and the divine energies that you need to find balance in your life. The 6 reflects “The Nurturer” here in the physical, while the 9 reflects the utmost in spiritual growth. If you are constantly seeing Angel Number 666, it is an intensified 6. This means that your concerns at the moment are heavily based here in the physical – you may be too focused on material needs and not lending enough of your spirit to spirituality and Source. Worry, materialism, obsession, and negative or fear-based thoughts may be plaguing you lately, and it is time to change your actions and thought pattern, both consciously and subconsciously. By reconnecting with your trust in the Universe, you can confidently refocus your attention on spirituality, which will always provide positive balance in your life. Healing is obviously necessary, and retracting from the material world to reconnect with spirit is the best path at this time. 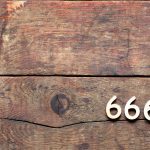 If you are one who has always heard that Angel Number 666 is negative in nature, utilize that to remind yourself of its true meaning. When you see it, remind yourself to release all fear-based thoughts and uncertainty. Make note of your thoughts at the time you saw the number, and apply this message of release to your current concerns.